A judge has suspended for 120 days the Guantanamo Bay trials of five men accused over the 9/11 attacks, as requested by US President Barack Obama. Among the five is alleged mastermind Khalid Sheikh Mohammed, who had opposed the suspension saying he wanted to confess to his role in the attacks. 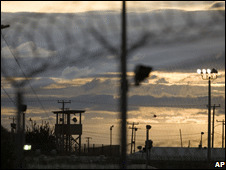 The new administration also circulated a draft order to close the Guantanamo Bay prison within a year. Mr Obama had earlier asked for a four-month halt to all tribunals there. The request was one of his first acts as president. Before the military judge's ruling in the 9/11 case, four men including Khalid Sheikh Mohammed said they opposed halting the trials. Lawyers for a fifth man supported the proposed suspension. Earlier a judge in a separate case - that of Omar Khadr, a Canadian man accused of killing an American soldier in Afghanistan in 2002 - suspended that trial. Lt Cmdr William Kuebler, a lawyer for Omar Khadr, said the practical effect of the ruling was "to pronounce this system dead". "There will certainly be no more military commissions in Guantanamo Bay," he said. The Obama administration is circulating a draft executive order calling for the closure of the detention centre. "The detention facilities at Guantanamo for individuals covered by this order shall be closed as soon as practicable, and no later than one year from the date of this order," the draft read. It calls for a review of all pending cases, and provides for some prisoners to be released and others to be transferred. It is not known when Mr Obama will issue the order. 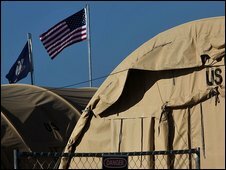 Mr Obama has repeatedly promised to close the camp, where some 250 inmates accused of having links to terrorism remain and 21 cases are pending. In his inaugural address on Tuesday, he emphasised the idea of respect for justice and the rights of the individual, rejecting "as false the choice between our safety and our ideals". A two-page document issued late the same day and ordered jointly by Mr Obama and the US Department of Defense, sought a 120-day suspension of trials. The delay would "permit the newly inaugurated president and his administration time to review the military commission process", the document said. The legal process has been widely criticised because the US military acts as jailer, judge and jury, the BBC's Jonathan Beale reports from Guantanamo. However, closing Guantanamo Bay will not be easy, he says. Questions remain over where those charged will be tried and where those freed can be safely sent. Our correspondent reports that the written ruling to suspend the 9/11 cases brought anger and frustration among representatives from five families of victims of the attacks, with one accusing Mr Obama of political posturing. But there was a sense of relief among defence lawyers, who had criticised the cases as "show trials". Human rights groups also welcomed the decision, as did the European Union. Michele Cercone, a spokesman for the EU Justice and Home Affairs Commission, said the Commission was "very pleased that one of the first actions of Mr Obama has been to turn the page on this sad episode of Guantanamo".